Once upon a time, I self-published my own comic books. The series Dirtbag followed by a more commercially titled series The X-Flies, from Twist & Shout Comics, myself and Californian tech guy Mike Meyer. I had the bright idea of going to comic book conventions and getting artists to draw jam sketches which I would then use as covers. 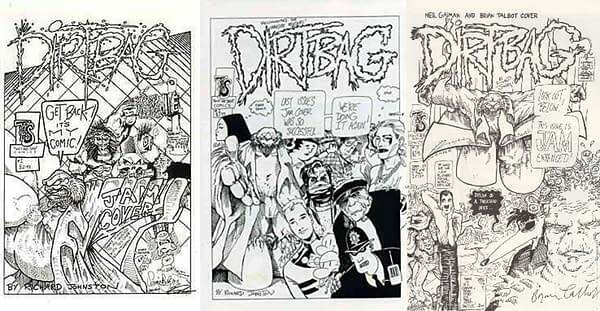 Dirtbag #1 featured the art of Simon Bisley, David Lloyd, Brian Bolland and Dave Sim, #2 had Mark Buckingham, Eddie Campbell, Jeff Smith, Duncan Fegredo, Steve Yeowell, Paul Grist, Gary Erskine and Woodrow Phoenix, #3 had Neil Gaiman and Bryan Talbot. Bill Schanes is currently remembering those days for us wholesale on Facebook. After regaling us with stories of the Great Distributor Wars and his relationship with Image Comics, he has moved onto the small press. Over the early years I was at Diamond, in 1986-1988, Diamond was taking a lot of criticism from small press creators and publishers about which comic books were or weren’t being offered through Diamond. I’ll go into those types of specific details in another posting in a few weeks time. Several important, high profile creators were very outspoken in regards to both creator rights, as well as the distributors role in bringing the creators original creations to comic book specialty retailers (CBSR). Dave Sim was not only creating Cerebus The Ardvark comic book series, but his publishing company, Ardvark-Vanaheim, also published other creators works, including Neil The Horse, Journey, and Puma Blues (more on Puma Blues in another memory I’ll be posting soon). Ah yes, the comic by Michael Zulli that Diamond refused to distribute when Dave Sim chose not to distribute his Cerebus phonebooks, but sell them directly. Looking forward to that one. We always enjoyed when publishers or creators stopped by our offices. A few years later, Dave wanted to come to our offices, and spend a typical “day in the life” of what goes on within the purchasing department at Diamond. Mark Herr, Diamond’s long time Purchasing Manager for the 5 comic brand managers walked Dave through what took place on a daily basis. This included a large number of emails waiting for each of the purchasing brand managers each morning. These included new books being solicited from already existing publishers, plus new inbound solicitations from brand new “publishers”. In addition, we received many new publisher solicitations via the mail, which arrived from professional pitches, to hand written notes on lined note paper, sometimes not including their contact information. Dave couldn’t believe how many solicitations Diamond was receiving, and how much effort the Diamond Brand Managers spent responding both in writing and in the mail to each and every inbound inquiry. What really shocked Dave was the vast majority of these “new” publishers were of so low amateurish quality (Dave used much harsher words), and that we took any time to respond to them.